The Xhosa people are speakers of Bantu languages living in south-east South Africa, and in the last two centuries throughout the southern and central-southern parts of the country. 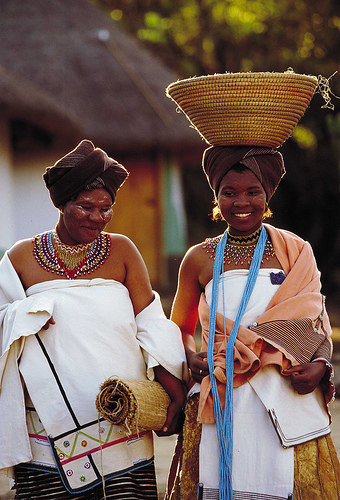 Xhosa-speaking peoples are divided into several tribes with related but distinct heritages. The main tribes are the Mpondo, Mpondomise, Bomvana, Xesibe and Thembu. In addition, the Bhaca and Mfengu have adopted the Xhosa language. The name "Xhosa" comes from that of a legendary leader called uXhosa. There is also a theory that the word xhosa derives from a word in some Khoi-khoi or San language meaning "fierce" or "angry", the amaXhosa being the fierce people. The Xhosa refer to themselves as the amaXhosa and to their language as isiXhosa. Presently approximately 8 million Xhosa people are distributed across the country, and Xhosa is South Africa's second most common home language, after Zulu, to which Xhosa is closely related. The pre-1994 apartheid system of bantustans denied Xhosas South African citizenship and attempted to confine them to the nominally self-governing "homelands" of Transkei and Ciskei, now both a part of the Eastern Cape Province where most Xhosa remain. Many Xhosa live in Cape Town (iKapa in Xhosa), East London (iMonti), and Port Elizabeth (iBhayi). The Xhosa are part of the South African Nguni migration which slowly moved south from the region around the Great Lakes, displacing the original Khoisan hunter gatherers of Southern Africa. Xhosa peoples were well established by the time of the Dutch arrival in the mid-17th century, and occupied much of eastern South Africa from the Fish River to land inhabited by Zulu-speakers south of the modern city of Durban. The Xhosa and white settlers first encountered one another around Somerset East in the early 18th century. In the late 18th century Afrikaner trekboers migrating outwards from Cape Town came into conflict with Xhosa pastoralists around the Great Fish River region of the Eastern Cape. Following more than 20 years of intermittent conflict, from 1811 to 1812 the Xhosas were forced east by British colonial forces in the Third Frontier War. In the years following, many Xhosa-speaking clans were pushed west by expansion of the Zulus, as the northern Nguni put pressure on the southern Nguni as part of the historical process known as the mfecane, or "scattering". The Xhosa-speaking southern Nguni people had initially split into the Gcaleka and the Rharhabe (who had moved westwards across the Kei river). Further subdivisions were made more complicated by the arrival of groups like the Mfengu and the Bhaca from the Mfecane wars. These newcomers came to speak the Xhosa language, and are sometimes considered to be Xhosa. Xhosa unity and ability to resist colonial expansion was further weakened by the famines and political divisions that followed the cattle-killing movement of 1856. Some historians argue that this early absorption into the wage economy is the ultimate origin of the long history of trade union membership and political leadership among Xhosa people. That history manifests itself today in high degrees of Xhosa representation in the leadership of the African National Congress, South Africa's ruling political party. Traditional Xhosa culture includes diviners known as amagqirha, who serve as herbalists, prophets, and healers for the community. This job is mostly taken by women, who spend five years in apprenticeship. The Xhosas have a strong oral tradition with many stories of ancestral heroes; according to tradition, the leader from whose name the Xhosa people take their name was the first King of the nation. One of Xhosa's descendents named Phalo gave birth to two sons Gcaleka, the heir and Rharhabe a son from the Right Hand house. Rharhabe the warrior wanted Gcaleka's throne but was defeated and banished and settled in the Amathole Mountains. Maxhobayakhawuleza Sandile Aa! Zanesizwe is the King in the Great Place in Mngqesha. Zwelonke Sigcawu was crowned King of the Xhosa on 18 June 2010. The key figure in the Xhosa oral tradition is the imbongi (plural: iimbongi) or praise singer. Iimbongi traditionally live close to the chief's "great place" (the cultural and political focus of his activity); they accompany the chief on important occasions - the imbongi Zolani Mkiva preceded Nelson Mandela at his Presidential inauguration in 1994. Iimbongis' poetry, called imibongo, praises the actions and adventures of chiefs and ancestors. The supreme being is called uThixo or uQamata. Ancestors act as intermediaries and play a part in the lives of the living; they are honoured in rituals. Dreams play an important role in divination and contact with ancestors. Traditional religious practice features rituals, initiations, and feasts. Modern rituals typically pertain to matters of illness and psychological well-being. Each person within the Xhosa culture has his/her place which is recognised by the entire community. Starting from birth, a Xhosa person goes through graduation stages which seek to recognise his growth and hence assign him a recognisable place in the community. This results in a number of stages that one must go through, each one of which is marked by a specific ritual aimed at introducing the individual to their counterparts and hence to the ancestors. Starting from “imbheleko” which is a ritual performed to introduce a new born to the ancestors to “Umphumo”; from “Indodana” (young elder) to “Ixhego” (elder). These rituals and ceremonies are still practiced today. The “Ulwaluko” and “Intonjane” are also traditions which separated this tribe from the rest of the Nguni tribes. These are performed to recognise the transition from boyhood to manhood and from girl to woman respectively. All these rituals are symbolic to one's development. Before these are performed, the individual gets to spend time with elders in the community in a bid to teach them of the “Do’s” and “Don’ts” in preparation for the next stage. A very interesting aspect of Xhosa culture is that this type of information is not written anywhere - it is transmitted from generation to generation by word of mouth. The “Isiduko” (clan) for instance – which matters most to the Xhosa identity (even more than names and surnames) are transferred from one to the other through word of mouth. Knowing your “Isiduko” is vital to the Xhosas and it is considered a shame and “Uburhanuka” (lack-of-identity) if one doesn’t know one's clan. This is considered so important that when two strangers meet for the first time, the first identity that gets shared is “Isiduko”. It is so important that two people with the same surname but different clan are considered total strangers but the same two people from the same clan but different surnames are regarded as close relatives. This forms the roots of "Ubuntu" (neighbouring) - a behaviour synonymous to this tribe as extending a helping hand to a complete stranger when in need. Ubuntu goes further than just helping one another - it is so deep that it even extends to looking after and reprimanding your neighbour's child when in the wrong. Hence the saying "it takes a village to raise a child". One traditional ritual that is still regularly practiced is the manhood ritual, a secret rite that marks the transition from boyhood to manhood (Ulwaluko). After ritual circumcision the initiates (abakhwetha) live in isolation for up to several weeks, often in the mountains. During the process of healing they smear white clay on their bodies and observe numerous taboos. Girls are also initiated into womanhood (Intonjane). They too are secluded, though for a shorter period. Female initiates are not circumcised. Other rites include the seclusion of mothers for ten days after giving birth, and the burial of the afterbirth and umbilical cord near the village. This is reflected in the traditional greeting Inkaba yakho iphi?, literally "Where is Your Navel?" The answer "tells someone where you live, what your clan affiliation is, and what your social status is and contains a wealth of cultural information. Most importantly, it determines where you belong". Xhosa is an agglutinative tonal language of the Bantu family. While the Xhosas call their language "isiXhosa," it is usually referred to as "Xhosa" in English. Written Xhosa uses a Latin alphabet-based system. Xhosa is spoken by about 18% of the South African population, and has some mutual intelligibility with Zulu. Many Xhosa speakers, particularly those living in urban areas, also speak Zulu and/or Afrikaans and/or English. As a result of the intermingling of Bantu and click-Speaking Khoisan tribes, isiXhosa has taken on several "click linguistics" characteristic of the Khoisan. Among its features, the Xhosa language famously has fifteen click sounds, originally borrowed from now extinct Khoisan languages of the region. Xhosa has three basic click consonants: a dental click, written with the letter "c"; a palatal click, written with the letter "q"; and a lateral click, written with the letter "x." There is also a simple inventory of five vowels (a, e, i, o, u).